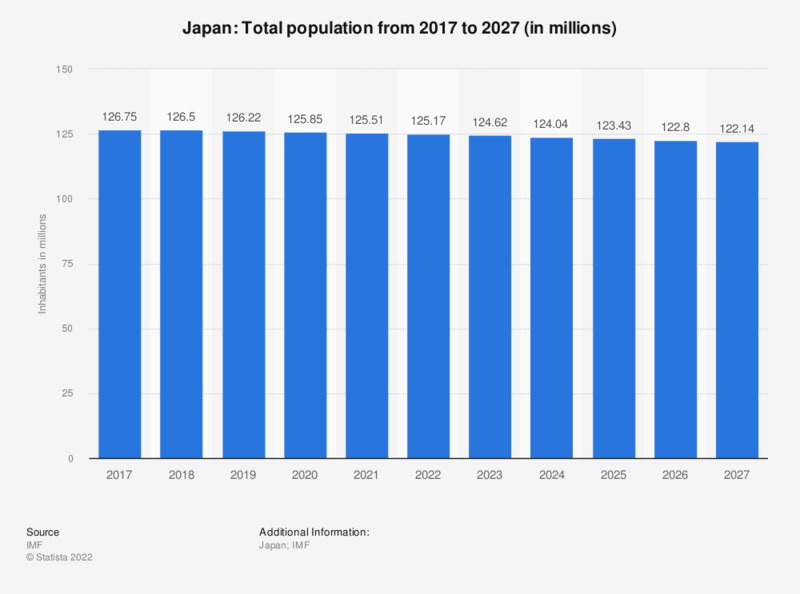 The statistic shows the total population in Japan from 2012 to 2017, with projections up until 2022. In 2017, the total population of Japan amounted to around 126.75 million inhabitants. See the figures for the population of South Korea for comparison. From steadily low fertility rates to a growing elderly population, it is no secret that Japan’s population is shrinking. Population growth rates jump around a little, but are currently following a declining trend. The post-war baby boom generation is now in the 65-and-over age group, and the percentage of the population in that category is expected to keep growing, as is indicated by a high median age and high life expectancy. Japan already has the highest percentage of its population over 65 in the world, and the aging population puts some pressure on the Japanese government to provide welfare services for more people as rising numbers leave the workforce. However, the amount of jobs opened up for the younger generations by the older generations leaving the workforce means that unemployment is kept to a minimum. Despite a jump in unemployment after the global recession hit in 2008, rates were almost back to pre-recession rates by 2013. Another factor affecting Japan is the number of emigrants to other countries. The United States absorbs a number of emigrants worldwide, so despite a stagnating birth rate, the U.S. has seen a steady rise in population.